South Brunswick was first mentioned on February 28, 1778, in Freeholder minutes as being formed from New Brunswick Township. It was formally incorporated as one of New Jersey's initial group of 104 townships on February 21, 1798. Portions of the township have been taken to form Cranbury Township (as of March 7, 1872) and Plainsboro Township (on April 1, 1919). 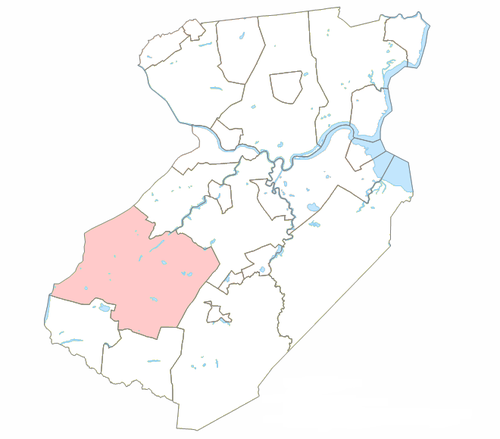 South Brunswick Township is located at 40Â°23â²06â³N 74Â°31â²23â³W (40.385022, â'74.522936). According to the United States Census Bureau, the township had a total area of 41.039 square miles (106.290Â km2), of which, 40.648 square miles (105.278Â km2) of it was land and 0.391 square miles (1.012Â km2) of it (0.95%) was water. Dayton (2010 Census population of 7,063), Heathcote (5,821), Kendall Park (9,339), Kingston (1,222 of a total CDP population of 1,493, with the balance in Franklin Township) and Monmouth Junction (2,887) are census-designated places (CDPs) and unincorporated communities located within South Brunswick Township. Cottageville, Deans, Franklin Park, Fresh Ponds, Little Rocky Hill, Sand Hills and South Brunswick Terrace are also unincorporated communities located within the Township. Because the township is served by several different zip codes, Dayton, Monmouth Junction, Kendall Park, Kingston, Jamesburg, Cranbury, Princeton and even North Brunswick are often used in place of the township's name, even when referring to areas located beyond their defined boundaries. With increased mobility and a growing population, the suburban style residential development was born after the World War II and Kendall Park was begun in the 1950s. Kendall Park is located off Route 27, the old Indian trail and major thoroughfare of earlier centuries. Pigeon Swamp State Park is a New Jersey state park located on Deans Rhode Hall Road (Middlesex CR-610). The park has 1,078 acres (4.36Â km2) of undeveloped land. South Brunswick is in the humid continental climate zone. Average Winter-time high temperatures range from 38 to 43Â Â°F (3 to 6Â Â°C), and the lows range from 19 to 24Â Â°F (â'7 to â'4Â Â°C) degrees with the record low being â'16Â Â°F (â'27Â Â°C). Average summer-time high temperatures range from 84 to 87Â Â°F (29 to 31Â Â°C), though temperatures exceed 90Â Â°F (32Â Â°C) often with the record high being 105Â Â°F (41Â Â°C). The summertime lows range from 63 to 67Â Â°F (17 to 19Â Â°C) degrees. South Brunswick can receive much snow during the winter months, sometimes up to 3 feet (0.91Â m). About 4 to 5 inches (10 to 13Â cm) of rain falls every month, and is evenly spread throughout the year, though the area can go through long periods of drought or long-lasting periods with little to no rain. During winter and early spring, South Brunswick can in some years experience "nor'easters", which are capable of causing blizzards or flooding throughout the northeastern United States. Hurricanes and tropical storms (such as Hurricane Irene in 2011), tornadoes and earthquakes are rare. At the 2010 United States Census, there were 43,417 people, 15,069 households, and 11,694 families residing in the township. The population density was 1,068.1 per square mile (412.4/km2). There were 15,708 housing units at an average density of 386.4 per square mile (149.2/km2). The racial makeup of the township was 52.08% (22,611) White, 7.71% (3,348) Black or African American, 0.17% (72) Native American, 35.91% (15,592) Asian, 0.02% (8) Pacific Islander, 1.52% (658) from other races, and 2.60% (1,128) from two or more races. Hispanics or Latinos of any race were 6.04% (2,624) of the population. There were 15,069 households, of which 44.3% had children under the age of 18 living with them, 66.1% were married couples living together, 8.8% had a female householder with no husband present, and 22.4% were non-families. 18.8% of all households were made up of individuals, and 6.0% had someone living alone who was 65 years of age or older. The average household size was 2.88 and the average family size was 3.33. In the township, 27.7% of the population were under the age of 18, 6.4% from 18 to 24, 27.7% from 25 to 44, 28.8% from 45 to 64, and 9.4% who were 65 years of age or older. The median age was 38.6 years. For every 100 females there were 93.9 males. For every 100 females age 18 and over, there were 90.4 males. The Census Bureau's 2006â"2010 American Community Survey showed that (in 2010 inflation-adjusted dollars) median household income was $100,950 (with a margin of error of +/- $2,777) and the median family income was $116,127 (+/- $5,529). Males had a median income of $81,297 (+/- $2,632) versus $55,477 (+/- $3,835) for females. The per capita income for the borough was $40,468 (+/- $1,430). About 2.1% of families and 3.1% of the population were below the poverty line, including 3.4% of those under age 18 and 5.6% of those age 65 or over. As of the 2000 United States Census there were 37,734 people, 13,428 households, and 10,084 families residing in the township. The population density was 923.5 people per square mile (356.6/kmÂ²). There were 13,862 housing units at an average density of 339.3 per square mile (131.0/kmÂ²). The racial makeup of the township was 70.49% White, 7.88% African American, 0.13% Native American, 18.04% Asian, 0.04% Pacific Islander, 1.37% from other races, and 2.04% from two or more races. Hispanic or Latino of any race were 5.08% of the population. As of the 2000 census, 10.48% of South Brunswick's residents identified themselves as being of Indian American ancestry, which was the seventh-highest of any municipality in the United States and the fourth highest in New Jersey â" behind Edison (17.75%), Plainsboro Township (16.97%) and Piscataway Township (12.49%) â" of all places with 1,000 or more residents identifying their ancestry. In the township the population was spread out with 28.4% under the age of 18, 5.7% from 18 to 24, 36.7% from 25 to 44, 21.8% from 45 to 64, and 7.3% who were 65 years of age or older. The median age was 35 years. For every 100 females there were 94.0 males. For every 100 females age 18 and over, there were 91.3 males. South Brunswick Township operates within the Faulkner Act, formally known as the Optional Municipal Charter Law, under the Faulkner Act (Council-Manager) form of municipal government. Members of the Township Council are elected at-large to four-year terms in partisan elections on a staggered basis with either two or three seats up for election every other year. At an reorganization meeting held in January after each election, the council selects a mayor and a deputy mayor from among its members. As of 2014, members of the Township Council are Mayor Frank Gambatese (D, term on council and as mayor ends December 31, 2014), Deputy Mayor Chris Killmurray (D; 2014), Joseph J. Camarota Jr. (D; 2016), Charlie Carley (D; 2016) and Josephine "Jo" Hochman (D, 2016). For the 2014-2015 Session, the 16th District of the New Jersey Legislature is represented in the State Senate by Christopher Bateman (R, Somerville) and in the General Assembly by Jack Ciattarelli (R, Hillsborough Township) and Donna Simon (R, Readington Township). The Governor of New Jersey is Chris Christie (R, Mendham Township). The Lieutenant Governor of New Jersey is Kim Guadagno (R, Monmouth Beach). In the 2008 presidential election, Democrat Barack Obama received 62.7% of the vote (11,452 cast), ahead of Republican John McCain with 35.7% (6,530 votes) and other candidates with 1.0% (176 votes), among the 18,275 ballots cast by the township's 24,803 registered voters, for a turnout of 73.7%. In the 2004 presidential election, Democrat John Kerry received 56.8% of the vote (9,346 ballots cast), outpolling Republican George W. Bush with 42.1% (6,925 votes) and other candidates with 0.6% (128 votes), among the 16,457 ballots cast by the township's 22,147 registered voters, for a turnout percentage of 74.3. In the 2009 gubernatorial election, Republican Chris Christie received 47.3% of the vote (5,355 ballots cast), ahead of Democrat Jon Corzine with 44.1% (4,991 votes), Independent Chris Daggett with 6.7% (758 votes) and other candidates with 0.8% (90 votes), among the 11,311 ballots cast by the township's 23,974 registered voters, yielding a 47.2% turnout. South Brunswick Township was incorporated by an act of the New Jersey Legislature on February 21, 1798. In the 18th and 19th centuries, the community was primarily agricultural. The Straight Turnpike, now U.S. Route 1, was constructed in 1804. 20th century South Brunswick has seen extensive transformation with the impact of American industrial technology. The New Brunswick and Trenton Fast Line began operation in 1900, a trolley line running parallel to the Old Straight Turnpike of 1804 (Route 1), intersecting George's Road just north of the Five Corners intersection in Dayton. This trolley provided daily passenger and freight service, stopping at a local crossroads. The New Jersey Turnpike opened in 1951, again roughly parallel to Route 1, on the eastern edge of the Township. One effect of the Turnpike opening up Interchange 8A (just outside the township) was the transformation of the agricultural area on the southeast corner of South Brunswick to that of a burgeoning industrial development. As of 2011, the majority of land between Route 130 and the turnpike consists largely of warehouses. In 1980, the township's population approached 18,000. In 1990, this figure reached 25,792 and by 2010, South Brunswick had over 43,000 residents. Much of the township's 42 square miles (110Â km2) remain undeveloped and there are still significant amounts of wetlands, woodlands and open space within the community. Playmobil USA, subsidiary of the BrandstÃ¤tter Group, has its headquarters in Dayton in the township. As of the 2011â"12 school year, the district's 10 schools had an enrollment of 8,997 students and 613.1 classroom teachers (on an FTE basis), for a studentâ"teacher ratio of 14.67:1. Schools in the district (with 2011â"12 enrollment data from the National Center for Education Statistics) are seven elementary schools â" Brooks Crossing Elementary School (grades K-5; 827 students), Brunswick Acres Elementary School (PreK-5; 555), Cambridge Elementary School (PreK-5; 552), Constable Elementary School (PreK-5; 529), Greenbrook Elementary School (K-5; 459), Indian Field Elementary School (K-5; 630) and Monmouth Junction Elementary School (K-5; 397) â" Crossroads Middle Schools North and South(6â"8; 1,095 and 1,108 respectively) and South Brunswick High School (9â"12; 2,845) for grades 9â"12. SBHS is home to the award-winning Viking Marching Band, the 2013 New Jersey State Champions. South Brunswick hosts U.S. Route 1, U.S. Route 130, Route 27, Route 32, and Interstate 95 (the New Jersey Turnpike). A few county routes, such as 535 and 522, pass through the town. US 1 passes through in the western part while US 130 runs through the center-eastern part. Other limited access roads that are accessible outside the township include Interstate 287 in neighboring Franklin Township. As of May 2010, the township had a total of 192.83 miles (310.33Â km) of roadways, of which 151.43 miles (243.70Â km) were maintained by the municipality, 21.09 miles (33.94Â km) by Middlesex County and 16.75 miles (26.96Â km) by the New Jersey Department of Transportation and 3.56 miles (5.73Â km) by the New Jersey Turnpike Authority. South Brunswick houses about a 3Â½ mile section of the New Jersey Turnpike in the eastern part of the township, and a few Turnpike ramps that lead to the toll gate for Interchange 8A which is just outside of the municipality in Monroe Township. Due to heavy congestion on the ramp to Route 32 west, the Turnpike Authority replaced it with a new two-lane ramp that extends from the toll gate to the intersection of CR 535 and Thatcher Road. Motorists must then take 535 south to access 32 west. From 1991 to 2014, the "dual-dual" setup (inner and outer roadways) of the Turnpike ended just south of Interchange 8A; construction on the extension of this set-up south to Interchange 6 in Mansfield Township, Burlington County was completed in early November 2014. An additional lane was constructed in each direction on the outer truck lanes from Interchange 8A to Interchange 9 in East Brunswick Township around the same time. A number of proposed Turnpike Authority maintained roads were to traverse South Brunswick. The first was the Driscoll Expressway which was to start from the Garden State Parkway at exit 80 in Toms River and end 3 miles north of exit 8A along the turnpike in South Brunswick. This was cancelled in the 1980s. The other proposed road was a west-east spur, Route 92. While the majority of the spur was to be in South Brunswick, it was to begin at US 1, just north of the intersection with Ridge Road in South Brunswick and terminate at the tollgate for Exit 8A in Monroe Township. However this was cancelled on December 1, 2006. Mohamed Sanu (born 1989), wide receiver for the Cincinnati Bengals. George Segal (1924â"2000), painter and sculptor associated with the Pop Art movement. He was presented with a National Medal of Arts in 1999.